A newly descovered ichthyosaur got in the news recently. It was found in a museum archive by a paleontologist. What catched my eye was the note that this was a “dolphin that got extinct 90 million years ago”. That’s weird, because according to the evolution fable, the ancestor of the dolphin, pakicetus, was still a land animal some 50 million years ago. I found that this is one of those “convergent evolution” stories. An animal got exctinct, and later a very similar animal got almost exactly the same properties. 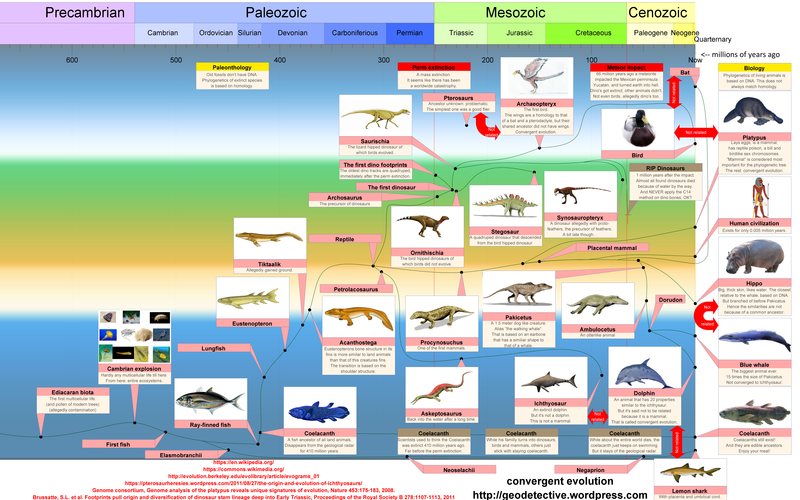 This inspired me to make a map of the evolutionary tree, to show the extremeness of “convergent evolution”. I’ve included a case of evolutionary stasis as well, using the coelacanth as example. Below is an illustration from wikipedia to show the similarities between ichthyosaur and the dolphin. A global flood would provide enough water… and enough bio material, as it is ripped off everywhere… and enough heat. All flood models that are available show that there must have been a lot of heat involved during the flood. Generating crude oil takes millions of years, or a global flood.